I’ve been working hard this summer on two quilts for my store, and I’m so pleased with how they turned out. The process completely re-energized me and now I can’t wait to design the next one. It was my goal to come up with something that was truly fit for a modern home but also had some elements of tradition attached. 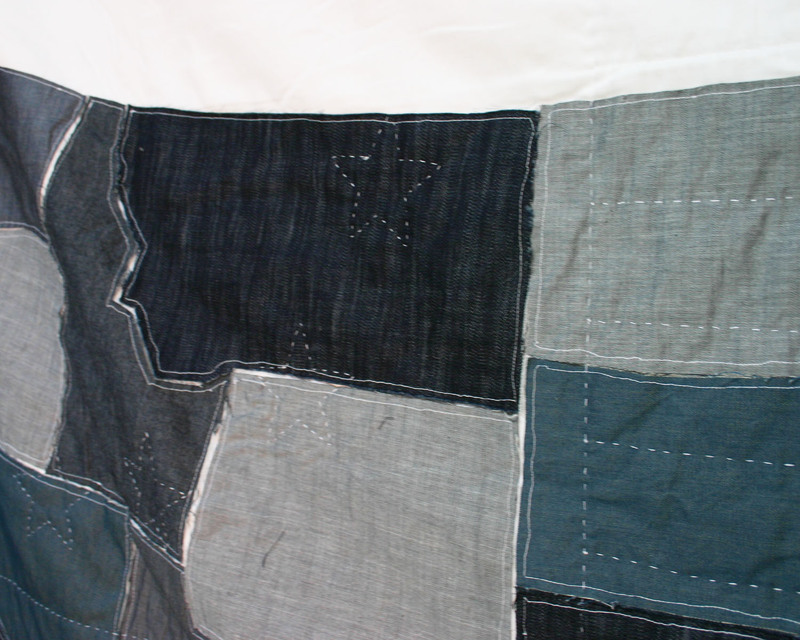 After a visit to a quilt museum, I settled on a spare map of the United States and a spin on an Amish quilt I had fallen in love with. 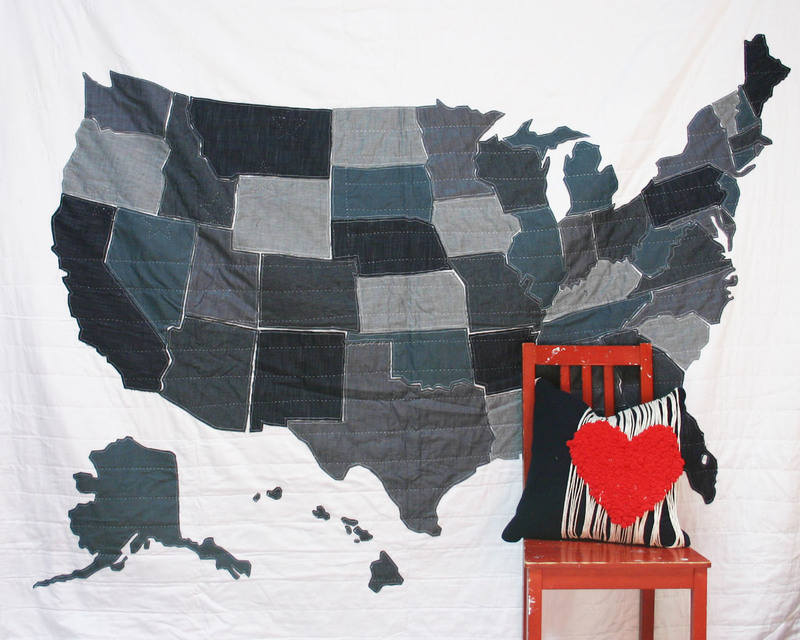 For the map quilt, I kept it simple and modern by appliqueing each state with a raw edge out of various denim fabrics on clean white and then hand-quilting the original 13 colonies flag on top. The Amish re-mix was a lot more complicated, but totally worth the work. I scaled four of the original circles up until they filled the whole quilt and then machine quilted doodles on top, as if from a school notebook. I adore the juxtaposition between the traditional idea of a quilt and the youthful, modern images and words hidden in the stitching. This is probably the most modest blog post that Delia has ever written. 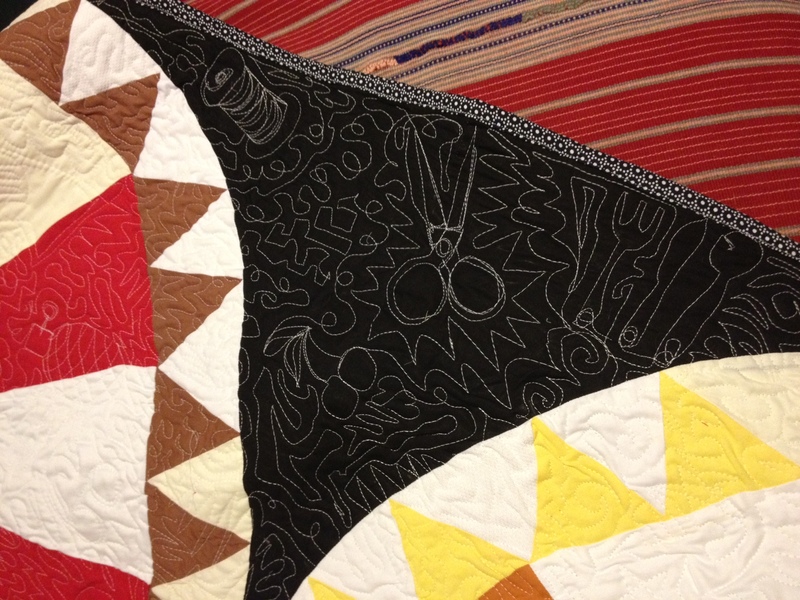 There’s one part of one sentence about machine quilting doodles that could be a whole post unto itself. 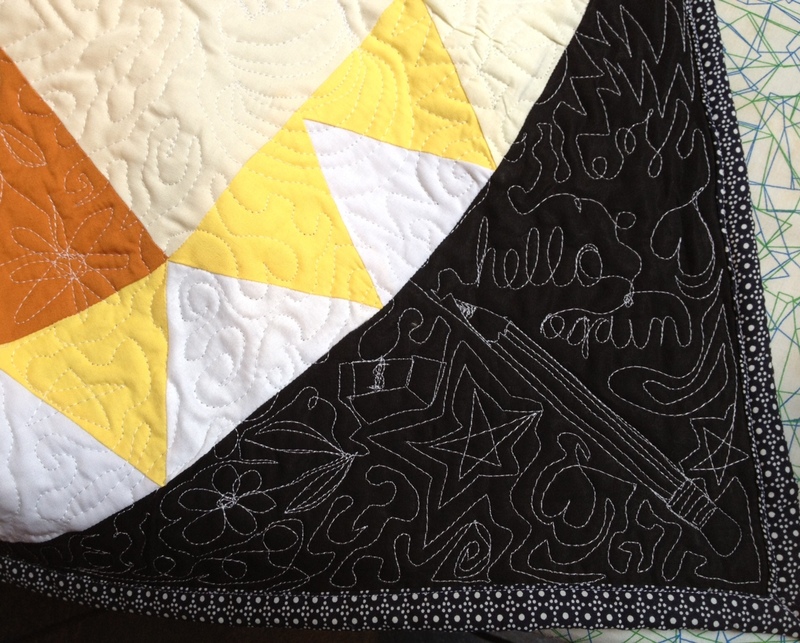 She made a list of objects and phrases to sew into the quilt, then sewed them in, interweaving them seamlessly, across about 70 square feet. Imagine making a single drawing, without lifting your pencil, on a 70 square foot piece of paper, then replace the paper with a blank quilt and the pencil with a sewing machine. That’s what she did, and after two straight days of looking at it on display at Renegade Craft fair, I still haven’t found every bit of charm hidden it it. 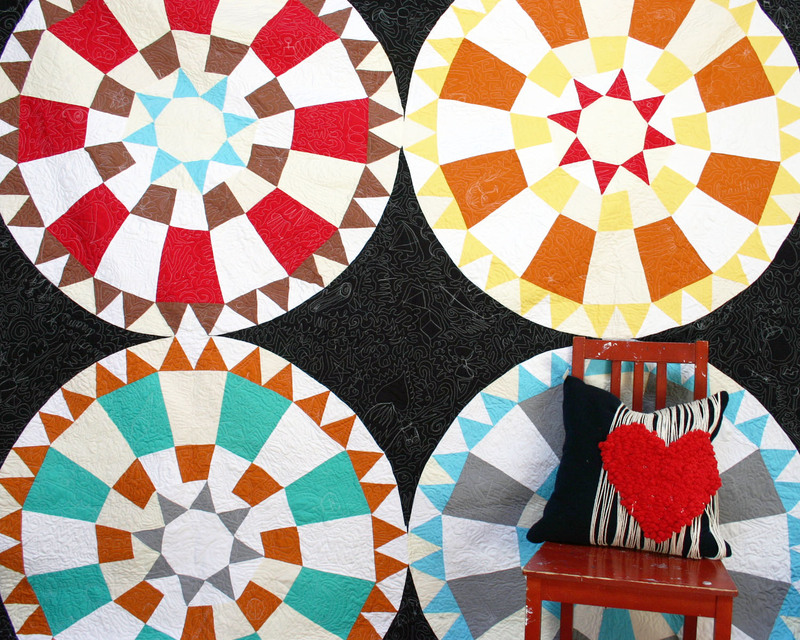 This quilt is an arresting work of art that you can sleep under if you choose to. 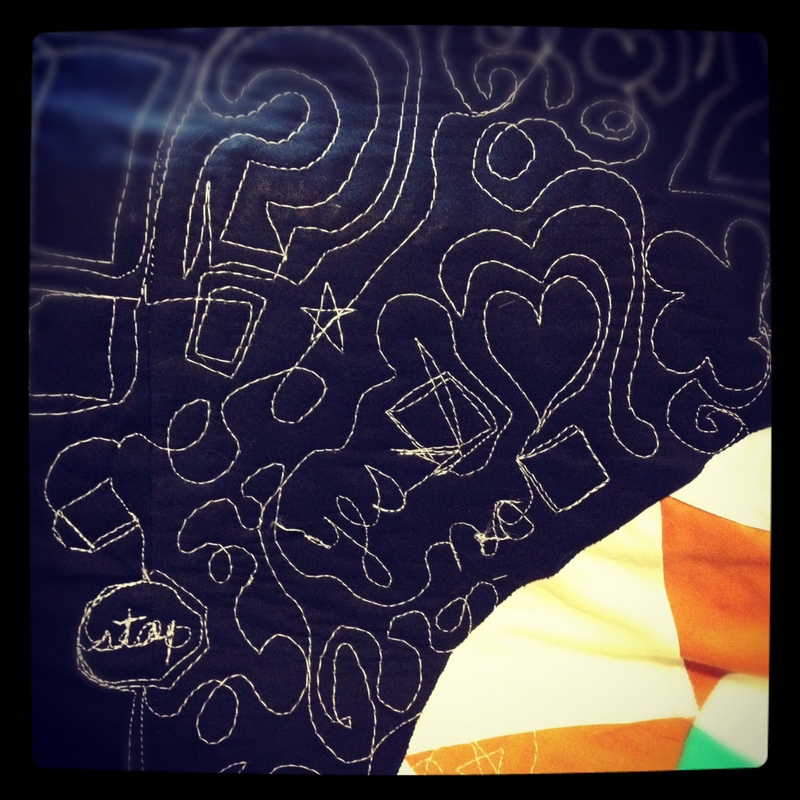 I am CRAZY about the quilt doodles. GENIUS!!!!! Will you take commissions? I think they would make great wedding gifts a la the traditional way people used to give quilts back in ye olde pioneer times. Maybe I just made that last part up. Anyway you cut it, these are DOPE, dude!!! Of course I’d take commissions! I love that tradition- I used to give quilts as wedding presents all the time, and the one we got for our wedding means so much to us! Delia, this is friggin’ fantastic. Obviously, all CMU costume grads can sew, but this is some seriously skillful (and beautiful) quilting. And I should know….it’s what I do for a living now. oops, that previous comment should not be anonymous. That means SO much coming from you Alison!! Thank you!